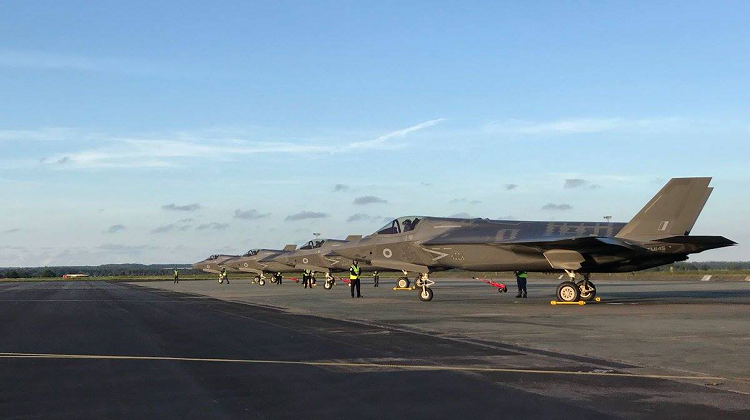 The first four Royal Air Force Lockheed Martin F-35B Lighting IIs arrived at their new home base at RAF Marham in Norfolk on June 6. The four aircraft of 617 Squadron, known as the ‘Dambusters’, ferried across the Atlantic Ocean from Marine Corps Air Station (MCAS) Beaufort in North Carolina where they have been based as the RAF builds up trained pilots and maintenance personnel. They were refuelled on the non-stop ferry by two RAF Airbus A330 MRTT Voyagers. 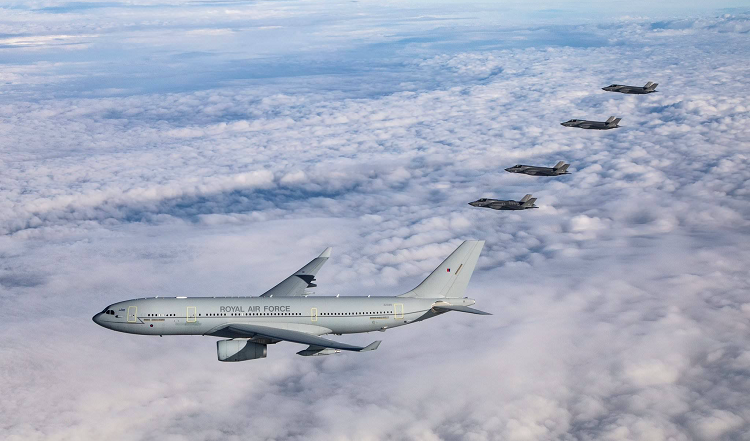 “This aircraft will truly transform how the UK conducts its defence operations and it is fitting that the next generation of combat air power has arrived as the RAF celebrates its centenary,” Lockheed Martin UK chief executive Peter Ruddock said in a statement. 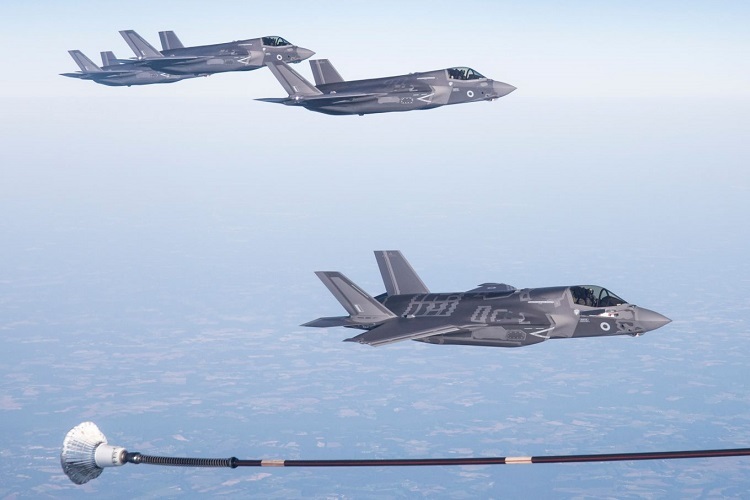 The ferry to the UK of the first four jets was conducted two months ahead of schedule, and the RAF now has a total of 15 F-35Bs in service at RAF Marham, MCAS Beaufort, and with the JSF Combined Test Force at Edwards AFB in California. 617 Sqn will continue to work up to before conducting its first at-sea trials aboard the Royal Navy’s new aircraft carrier HMS Queen Elizabeth II later in 2018, ahead of achieving an initial operational capability by the end of the year. It’s just HMS Queen Elizabeth, without a II. Also, 617 isn’t doing the first carrier trials later this year. That work belongs to the boffins and TP crowd at Beaufort. Drivers are expected to be the three UK TPs (one RAF, one RN and one BAE) and an American. I wouldn’t mind if Australia picked up a dozen or so F35Bs. Seems a waste having two large LHD with ski jumps and nothing to fly off them. Good pick up, its actually named after the Queen Mother who was known as Queen Elizabeth as opposed to Queen Elizabeth 1 or Queen Elizabeth 11. She is named in honour of the first Queen Elizabeth, a renowned World War I era super-dreadnought, which in turn was named after Queen Elizabeth I. The new Queen Elizabeth will carry her namesake’s honours, as well as her Tudor rose-adorned crest and motto. Raymond, please note that CAF cited the F-35B, along with F-35A and Rhino, as a contender for Air 6000 2C at an ASPI dinner in July 2016. After his his speech he took questions from the floor and openly said, in answer, those three were in the mix, although he said the Rhino option was very, very unlikely. So, if the B gets the nod, then who knows how it will end up in ADF service? We don’t know, and won’t for at least another four years (ie CAF slated the decision for 2022-25, hoping for the earlier date if possible). The project office is in total Trappist clam mode over all this, as per the SEA 5000 people and the frigates. Patience is all to we observers. Back on subject, the UK TPs for first embarked trials in US waters will be Andy Edgell (RAF), Nathan Gray (RN FAA) and Peter Wilson (BAE Systems). The US pilot unnamed, as yet. Best of luck to all. Mick C, please note that I have seen the carrier described in a posh broadsheet newspaper, and I swear I am not making this up, as HMS QE2. Gawd! The Canberra Class LHDs can’t support or have F-35Bs on board full time due to being designed to comply with Lloyds Rules plus the internal layout was modified for helicopters and so on. It has been stated it is cheaper to buy new LHDs designed for F-35bs than it is to refit our current 2 ships. I personally do think we should invest in additional LHDs for F-35s along with an improved version of the PA2 carrier which is a cat and trap version of the Queen Elizebeth. Yes, I know cost money and keep dream as we all know it won’t happen sadly.